As with its long and glorious history, Thailand is amazingly rich in cultural heritage. The most important element that has been, and will continue to be, the major driving force of cultural development in Thailand is the belief in Theravada Buddhism. We can see that everyday Thai life and important festivals all heavily involve Buddhism. Belief in Buddhism has also inspired Thai artists to create and develop classical arts, be they sculpture, architecture, painting or early literature, which depict stories relating to Buddhist life. 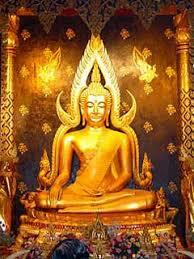 Theravada Buddhism is the national religion practiced by more than 95 per cent of Thai people. It is deeply rooted in the Thai spirit, due mainly to the strong and continuous support accorded by monarchs since ancient times. It was during the reign of King Ramkhamhaeng of the Sukhothai kingdom that Theravada Buddhism was permanently established as the dominant religion. The Buddhist concepts of virtue, such as the ten precepts of ‘Tossapitrajadharma’, were adopted as the correct path for righteous rulers. This practice has become the royal tradition until the present day. Since the Sukhothai era, Buddhism has continued to flourish in the kingdom, always patronized by royalty in spite of tremendous social changes. The present monarch, King Bhumibhol Adulyadej, has given unstinting royal support to Buddhism. In his Oath of Succession to the Throne, pledged during his coronation in 1950, he said ‘I will reign with righteousness for the benefit and happiness of Siamese.’ Clearly, Buddhist concepts remain at the core of the monarchic institution. From the kings, Buddhism trickled down to the common people. It gained a wide acceptance because of its emphasis on tolerance and individual initiative, which, complemented well with the Thais’ cherished sense of freedom. Buddhist teachings have also had a great influence in shaping the Thai character in various ways. The obvious example is the Thai belief in the merit of giving and the concept of karma. Karma suggests that selfishness and craving result in suffering. Giving, on the other hand, is a way to reduce selfishness, to become more contented with life. The concept of merit making is seen in many aspects of traditional Thai life. The idea of giving has been passed down through many generations, so it is easy for Thais to spontaneously extend their hospitality to other people. This uniquely Thai characteristic is highly appreciated among international travelers visiting the Kingdom. Buddhism has been influential in shaping the Thai arts. We can see it in Thai-style architecture, sculpture, painting, and literature. Buddhism and the arts are inextricably linked. Undoubtedly, the best place to see the classical Thai arts is the Buddhist temple. The superimposed and multi-colored tile roofs and the magnificent gables with decorated edges and sharp pointed ends are unique features of Thai temples. Thai-style sculpture and mural paintings can also be seen in Buddhist temples. The greatest evidence of Thai sculpture can be seen in images of the Buddha in various postures and attitudes. Typical Thai paintings, too, are omnipresent on the interior walls of temple ordination halls (bots), assembly halls (viharns) and galleries. Although, Buddhism is the primary and state religion, Thais have always subscribed to the ideal of religious freedom. Other than the 95 per cent of Thai people that practice Theravada Buddhism, several minority groups follow other religions. Muslims are the largest religious minority, representing about 4% of the populace. Thai Muslims are concentrated mainly in the southernmost provinces of Narathiwat, Pattani, Yala and Satun. Most Thai Muslims are of Malay descent, reflecting the common cultural heritage Thailand’s southernmost provinces share with Malaysia. Another half a per cent of the population follow the Christian religion, while the remainder comprise Confucians, Taoists, Mahayana Buddhists, Hindus and Sikhs. Mahayana Buddhists and Taoists are found primarily among Thailand’s ethnic Chinese and Vietnamese. Mahayana temples are distinctive with a strong Chinese influence on architecture and decor. The Hindu and Sikh communities are mostly concentrated in Bangkok. There are four main Hindu temples, while the Sikhs worship at two different temples. Both Hindu and Buddhist devotees frequent several Brahman shrines. Despite the different religious beliefs prevailing in the country, all are upheld and supported by both the monarch and the government. Thus amidst a rich diversity of beliefs, the people of Thailand have always lived together in peace and harmony.